KIGALI – President Paul Kagame has commended the Catholic Church for supplementing the government of Rwanda in providing education and health services. 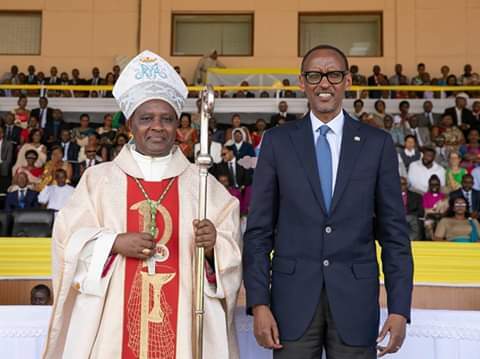 “We recognise the value of the Catholic Church’s partnership with Rwandans, particularly in the provision of education and health services to our population, regardless of their religious affiliation,” said Kagame. “During my visit to the Vatican, the Holy Father made a humble gesture, calling on God to forgive the Church as a whole, for the Church’s failure in our tragic history. This was a major milestone, which we are all called upon to perfect, by working together as religious institutions and government in a positive way, based not on the past, but on the future we want. Let us put the Pope’s teaching into practice, and most importantly, into the hearts of the clergy and the faithful. We want the Church to be a full partner in building this nation, and the foundation of unity and reconciliation upon which it is based,” he added. President Kagame was speaking at the consecration of Antoine Kambanda as the new Archbishop of Kigali. “This is not ordinary especially if we see what happens elsewhere. The steps we have taken should make other religions also learn from this so as to develop and grow stronger… We cannot get to God when people are not well-off which we can do by helping others to achieve it,” Kagame said. Kambanda’s installation as Archbishop of Kigali diocese comes almost two years after Kagame and the First Lady in person met and discussed with Pope Francis on the future of the church- of which Kagame said the talks would see many new good things. The new Catholic leader Kambanda started his religious journey in Kigali and was ordained in the same archdiocese of Kigali which he served until his ordination as bishop in Kibungo diocese. Kambanda becomes the third archbishop of Kigali replacing his predecessor Archbishop Thadée Ntihinyurwa who has been serving from March 1996–November 2018) until his retirement last year, after taking over from Bishop Vincent Nsengiyumva (1976–1994). In his remarks, Kambanda praised Kagame for his leadership and intent to build the relationship between Rwanda and the Vatican in his visit in 2017 in Rome and promised full collaboration with government to develop the country. In this partnership, he said, the focus will be on developing family life and grooming youth as the basis for nation building to spread our gospel so that it enables children to know God and Christian values at a time when the society is destroyed by foreign cultures. “I will work for the people of Rwanda to love and serve their country so that we leave a good legacy for the young generation and this will be by putting the goal of Jesus of giving life and life to the fullest,” Kambanda pledged. His predecessor, Bishop Ntihinyurwa also said that as he goes into retirement, he has lived a full Christian life and served the church with commitment, which he would like to see passed on to the community of Christians. He thanked the community and God who helped him diligently in all ways and asked them to remain steadfast.